28 Day Focus Challenge is Starting February 4th. Click the image below to access the goal tracker! How to use the goal tracker. ⇒ Set one specific and measurable food related goal. Example: I will food journal 5 full days a week. ⇒ Set one specific and measurable exercise related goal. Example: I will walk 20 minutes four times a week. ⇒ Pick a “prize” to celebrate reaching your goal. Example: $75 gift card to my favorite store. BONUS: Pair up with a friend and buy each other the gift card. I do this with my Sister-in-Law! 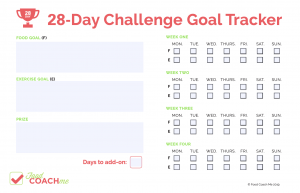 ⇒ Simply check the box under each week for the food goal (F) and the exercise goal (E). ⇒ Because life happens, the extra circle for “days to add on” is in the event the 28 days is over but you missed 4 of the walks you needed to hit your goal. Add those on and you can still earn that prize! This is a simple sheet to print off and keep somewhere you sit daily. Mine is at my vanity when I am getting ready in the morning, after my walk. You can also keep notes or change things as you’d like. See my official goal tracker from last month below. How to join the challenge. 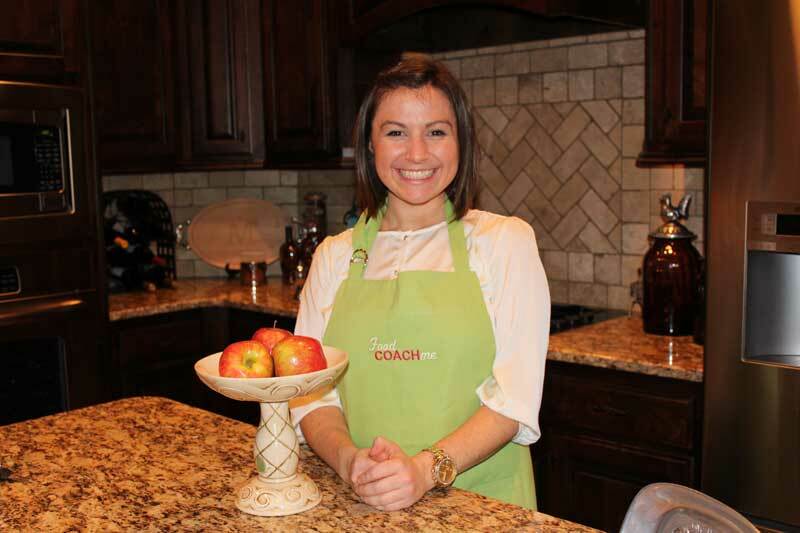 The challenge is reserved for FoodCoach.Me Premier Access Members. It’s not an additional charge but is an exclusive members benefit. If you’re a current member, watch your email Monday morning for the link to the enrollment form. Download your goal tracker now to have your goal front of mind when you enroll! This helps me create resources that best support the goals members are picking. Set your goals LIVE with other participants in our chat this Sunday! If you are not a current member, you can join right now and access meal plans, videos, recipes and our closed members group! You’ll be set and ready to go when enrollment opens. Enrollment CLOSES on Friday, February 1st at Noon (CST). At this point, membership is always open but the window to join the challenge closes.